We know most people have a tried and true Thanksgiving regimen: Turkey preparation is routine, and the accompaniments never change. Green bean casserole, brussels sprouts, sweet potato casserole, cranberry sauce, and mashed potatoes are on the holiday menu, year after year. There’s nothing wrong with the classics, but if you’re looking for something just a little different, may we offer our humble Thanksgiving side dishes suggestions? You likely haven’t thought to include a vibrant, autumnal sweet Italian sausage succotash to your Thanksgiving spread, but we promise it’s a great decision. How about some grilled vegetables doused in aged balsamic? The oven doesn’t have to be the only appliance to get a workout this holiday season, especially if you live in warmer climates. If you’re leaning to a more indulgent meal, we’ve still got you covered. Bacon and gruyere kugel provides the perfect creamy, carb-y counter to turkey, while gluten-free beefy mac n’ cheese ensures even those with a gluten intolerance can fill up on a decadent, Southern-inspired dish. Regardless of which side dishes you opt to include on your table, we promise you won’t regret it. You can’t have Thanksgiving without a sweet and savory stuffing on your table — well, you shouldn’t, at least. This sausage and apple stuffing is a delicious take on the classic Thanksgiving side dish, tossing cubes of crusty brown bread with Gala apples and ground breakfast sausage or ground Italian sausage. The crispy-edged dish gets its distinct flavor profile from a combination of fennel, sage, and thyme, as well as a blend of smoked paprika, apple cider, and chicken stock. Celery and onions add crunch, while mushrooms add an umami element. Borrow this Jewish holiday-inspired (non-kosher) bacon and Gruyere kugel for your own Thanksgiving table this year. It’s the very definition of hearty, using up five whole pounds of russet potatoes for this “pudding” casserole. Traditionally an Ashkenazi celebratory dish, kugel is a baked pudding comprised of potatoes or egg noodles. This creamy take on the dish opts for potatoes and adds salty and crisp bacon as well as melty Gruyere cheese. It’s spicy and warm thanks to the addition of nutmeg. Bonus: It’s naturally gluten-free! Don’t forget the veggies on your Thanksgiving table! This sweet Italian sausage succotash is nutrient-rich and packed with colorful, vibrant roasted vegetables like delicata squash, fresh corn, and edamame. While it makes for a richly-colored addition to your table, it’s also a nutritious counterpoint to hearty casseroles and the massive amount of carbs that always appear in the form of dinner rolls and creamy mashed potatoes. Don’t worry, this great Thanksgiving recipe has some protein for satiety’s sake, in the form of ground sweet Italian sausage. The addition of edamame in place of lima beans also adds extra protein. Cornbread makes for a perfect comfort food addition to any festive dinner spread, and this gluten-free skillet cornbread with breakfast sausage really ups the ante with the addition of sage-flavored ground breakfast sausage. You might associate breakfast sausage with, well, breakfast, but we promise it won’t let you down here. 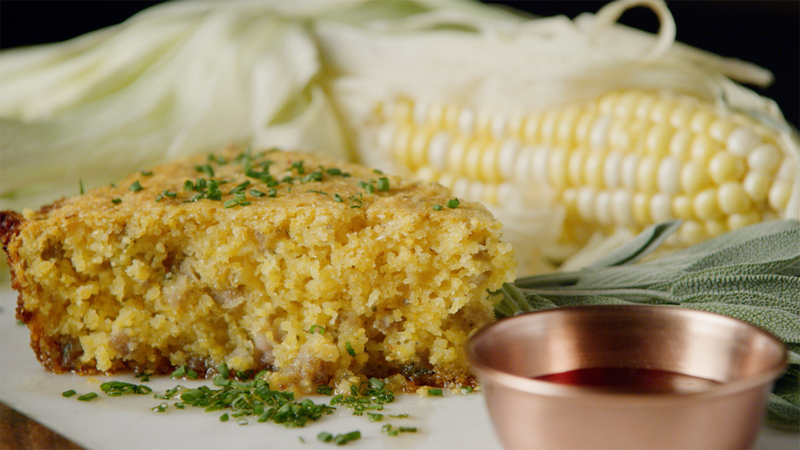 The herbaceous touch of sage is very autumnal, and your guests won’t question this skillet cornbread’s place on the Thanksgiving table once they get a bite of its crumbly, sweet and savory self. Once this unique Thanksgiving side dish turns golden-brown in your cast iron skillet, top with a bit of butter and drizzle with some maple syrup or honey. Mac n’ cheese is a welcome addition to any family dinner, and this gluten-free beefy mac n’ cheese is the perfect Southern-inspired side dish recipe for your Thanksgiving spread. 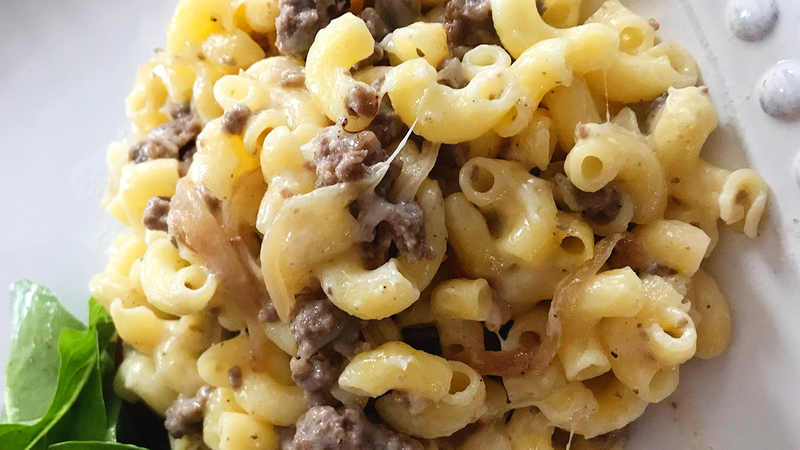 Rich and creamy on its own, this mac n’ cheese really benefits from the addition of juicy ground beef. Swiss cheese serves as the melty cheese sauce base in this comfort food recipe and requires little more than onion, a gluten-free roux, and salt and pepper to shine. This recipe has the benefit of coming together with minimal ingredients and time, letting you enjoy your guests more. It’s also gluten-free, which is awesome for anyone with a gluten intolerance. They can still indulge without feeling left out! 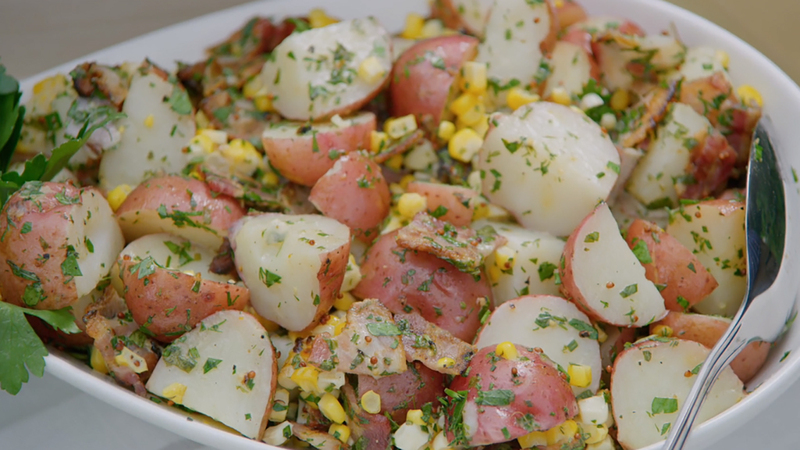 Fork-tender red potatoes are tossed in a champagne vinaigrette alongside a fresh herb blend of chives, parsley, Tarragon, and dill. It’s refreshing, creamy and bright, and with so many heavy dishes on the table, a delicious alternative to mashed potatoes. Fresh, grilled corn adds crunch and sweetness and bacon adds an unctuous, savory element. Nobody will complain to see this side dish on a festive Thanksgiving Day spread. Even in the fall, veggies are delicious when they get the flame-kissed treatment. These grilled veggies with aged balsamic add so much flavor to your table, your guests will forget they’re noshing on something healthy. This recipe calls for asparagus spears, red onions, Portobello mushrooms, corn, Japanese eggplant, red and Cubanelle peppers. These make for a delicious combination when doused with aged balsamic vinegar and grilled. If it’s too cold to light up the grill, don’t worry, these veggies are great roasted as well. Add in some more seasonal fare like butternut squash, roasted carrots, sweet potatoes, and roasted cauliflower, and you have the perfect holiday side dish.